If you’re a mom in today’s day and age, you’ve no doubt heard about The Wonder Weeks, written by a husband-and-wife team, outlining the 10 “wonder weeks” (which often cause sleep regressions), that all babies go through in the first 20 months of life. 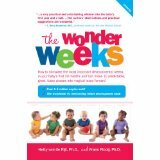 The book outlines when and why each “wonder week” happens; it also offers parents insights into how to help their babies navigate each wonder week, and turn it into a leap forward for baby. Here is how the wonder weeks impact sleep! 5 Weeks Changing Sensations Your newborn is “waking up”, becoming more alert, and noticing the world around her. This is understandably overwhelming for newborns! This is when “the witching hour” usually starts – that period of fussiness from about about 5 – 10 or 11 p.m. Be available to cuddle baby often (wearing baby is a great idea at this time); you may also need to feed more frequently in the evening. Baby may also go through a growth spurt at this time. Finally, keep in mind that this wonder week overlaps a bit with the 6 week peak of fussiness. 8-9 Weeks Patterns Baby is beginning to recognize and create simple patterns in his world; he’ll practice moving his hands in the same way over and over, or make the same grunting sound again and again. All this curiosity and alertness can make it hard for baby to settle and fall sleep, so be sure to make your nursery sleep-friendly – it should be dim and quiet. This is also a great time to begin working on simple sleep time routines – start doing the same patterns of events at nap time and bedtime. 12 Weeks Smooth Transitions Baby’s movements become smoother and more coordinated; baby also begins to recognize changes in her world, and the patterns of these changes (i.e. every time the dryer buzzer goes off, mom leaves the room). Baby is getting squirmier at this age, and becoming more active – and that can mean changes to your sleep routine. Your baby may start breaking free of the swaddle. Some parents find that baby’s newfound ability to roll interferes with sleep – baby can roll from back to tummy, but not the other way around. Other parents notice that their babies settle into a semi-regular sleeping and feeding schedule at this age. 15-19 Weeks Events Baby is learning to recognize cause and effect, and to predict outcomes (i.e. ‘If I drop this toy, it will fall to the ground, and dad will come and pick it up’). Welcome to the 4 month sleep regression! If baby’s sleep was predictable up to this point, it may all fall apart now. Continue to work on building consistent sleep routines; this will help baby learn that certain events mean sleep is coming. You may also want to work on identifying any sleep associations baby may have; that will help with sleep training. There’s also another growth spurt that happens around 4 months. 23-26 Weeks Relationships Baby begins to perceive distance at this point – the world becomes a much bigger place for her! This may be one reason why many babies begin rolling/crawling at this time. Separation anxiety may become a problem at nap time and bedtime, since baby now understands that when you leave, you’re far away. This is also a great time to sleep train your baby – work on weaning your baby away from her sleep associations, and on helping her learn to fall asleep independently. Finally, there’s yet another growth spurt that happens around 6 months, for most babies. 42-46 Weeks Sequences Baby begins recognizing the steps involved in simple tasks, like getting dressed, or making lunch. Baby can also apply this to his own tasks – socks have to go on before shoes. Routines are so key at this stage; most babies love knowing what comes next, so work to continue strengthening your sleep routines. You may find that your baby goes through the brief 12 month sleep regression around this time, and tries to give up her morning nap; we advise that you stick to two naps for now, as most babies this age can’t manage with just one nap. 52-55 Weeks Programs Your toddler builds on his understanding of sequences, and starts to learn that there is more than one way (or one “sequence”) to accomplish the same task. This is also when most toddlers start showing strong preferences (i.e. pink socks are great, but green socks are bad). Welcome to toddlerhood, parents! At this stage, separation anxiety often comes back with a vengeance. You may also start to see some nap time and bedtime resistance at this point, as your toddler is learning to assert his independence and preferences. 61-64 Weeks Principles This stage is related to the cause-and-effect breakthrough we saw in the 15-19 week stage, only now, your toddler is learning how to use cause-and-effect to achieve her goals. She is also learning that her actions have certain consequences It’s time to talk about the D-word, parents – discipline. Your toddler is learning fast how you respond to her actions, so be sure that you are sending the right messages with your responses. This is the time to start establishing boundaries and setting limits for your toddler surrounding sleep, and enforcing them. We often tell parents that at this age, sleep problems are rarely sleep problems – they are discipline problems. 72-76 Weeks Systems Your toddler is capable of understanding larger systems now – for instance, she knows that the procedures and expectations at daycare are different than those at home. Your toddler can also change her behavior and actions to suit different situations, which explains why your toddler may be sweet and helpful for the babysitter, but grumpy and whiny for you (which is not at all uncommon, by the way!). If it hasn’t already, your toddler’s ‘toddler attitude’ may show itself full-force around this time. Continue to enforce your sleep time boundaries and limits. By 17 or 18 months, tantrums are common. Toddler tantrums at bedtime and nap time are especially frustrating – it’s key that you stand firm during these tantrums. Also, watch for the 18 month sleep regression that happens at about this time; it tends to be one of the toughest. Whew – that’s a lot of information to take in, isn’t it? If you’re struggling to make sense of all this, remember that you don’t have to make sense of it alone. Scroll down and check out ourbaby parenting sleep blog diy resources below, and let us guide you down the path to better baby and toddler sleep! Has your baby gone through the Wonder Weeks stage? 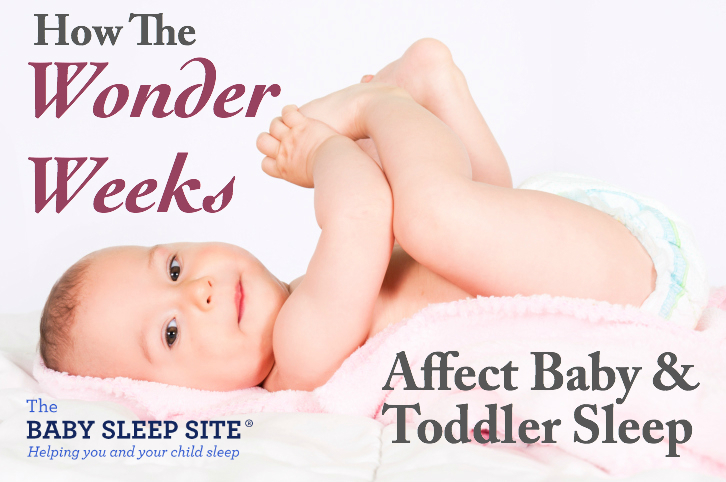 How has it affected your baby’s sleep? Scroll down to share your story and to hear from other parents just like you! My son is 15 months and will not sleep!!! He was doing great sleeping aroumd 8-9 hours all night then suddenly 3 weeks ago he stopped and now will not sleep hardly at all like a 180 change.. he will act tired amd go down around 10pm sleep till 12 am then stay up all the way till 10 am with no naps or nothing then crash for a few hours to do it again. Hes been super fussy and i cant leave the room without him throwing a fit or chasing after me which wasnt much like him before either…i dont know whats going on with him hes never acted like this or had this much of a hard time sleeping…any advice? Hi Emmamae – Thank you for writing to us, and I am sorry that sleep has been so rough for you and your 15 month old! Being awake from 12am till 10am is brutal!! Since you mentioned it coming on suddenly, I would recommend checking in with your little one’s doctor, to rule out any illnesses or physical reason for this abrupt change. If you get the all clear from his doctors, it may be time to really dive into his schedule to see what is going on. One of our expert sleep consultants would love to take an in depth look at his sleep history and details about his day and night sleep and can help with 100% personalized and customized help. She would want/need to look at the whole picture to find out why his sleep regressed so badly and to then make a plan to help! “It’s time to talk about the D-word, parents – discipline.”? Why you would punish any child let alone a baby is beyond me. And if you’re child is grumpy with you and not strangers it’s because they feel safe releasing those emotions. And that’s important. Hi @Haley and thank you for stopping by the Baby Sleep Site. I apologize if you were upset by this portion of the article. The Wonder Weeks is a book (and app) that many parents today are using and we wanted to be sure to highlight how the big developmental changes covered in the book can affect sleep and behaviors of the child. We of course know that all parenting philosophies are different as well as all children, so we try to cover the bases and provide information that each family is welcome to use and decide what works best for them. 🙂 By “Discipline” we just mean setting some limits for the child in order to protect their sleep, not punishing them (you can see our suggestions in this article: https://www.babysleepsite.com/toddlers/limit-setting-toddler/). We understand they are young and figuring out life so being grumpy and pushing limits is an important part of the process and I definitely agree, should not be discouraged, but often they need some guidance. I hope that provides more clarity where the article was coming from. Thanks for adding to our discussion! I’m just wondering if you recommend starting to sleep train during one of the wonder weeks? My son is just over 9 months and I normally nurse him to sleep. He usually naps really well (twice a day for an hour and a half), and up at night only once or twice. We’ve just started the 7th leap and he is definitely sleeping way worse. He’s pretty much refusing to nap so I feel like the only thing I can do is let him cry for a while. I’ve read lots about sleep training so I feel like I know what to do, I just haven’t wanted to listen to him cry ye. And now I’m just not sure I should be starting during this leap. Any advice? Thanks! Hang in there! I hope things get better for you guys again soon! Hi, my daughter is 28 weeks old and we can’t get out of her sight without her instantly crying (crying hard at times). Even if she is playing with toys on the floor and we are in the same room if we aren’t holding her or on the floor with her she is crying. Just all of a sudden super clinging and just doesn’t seem happy at all. Any advice or words of wisdom? @Nacaela I’m sorry to hear this! It sounds like your daughter is experiencing some separation anxiety, which is very common at this age. You might be interested in this article we have on this topic: https://www.babysleepsite.com/sleep-training/baby-toddler-sleep-separation-anxiety Hope this helps and good luck! Thanks Emily! I have thought about sleep consultations, but unfortunately, right now, funds are a bit tight. As I mentioned, she was on a pretty good schedule until she turned 1 and then that’s when the troubles started. I’m hoping that she just settles back down and adjusts to the 1 nap a day routine quickly and begins to wake at around 7 or so in the morning instead of much earlier than that! We have been trying to put her to bed about 30 min earlier than what we used to, so hopefully that helps??? @ Jaime – I hope it does! And you’re right in thinking that since this cropped up suddenly, it may just as well fade quickly as well. Good luck to you, Jaime! Sorry – 1 more question I forgot to ask: Over the last couple of days, my daughter has also been waking up earlier than normal. On Saturday, she woke up at 6 and today (Monday) at 5:30. She will not fall asleep even when we let her fuss/cry it out. Once we enter her room to even try and soothe her, she’s awake. So on days like these – how should I alter her nap? And how can I ensure that this doesn’t become the norm? She is sick right now, so I’m hoping that the early rising is just a phase and not permanent! PLEASE PLEASE HELP! She used to be on a very predictable schedule until she turned 1, then I’m not sure what all went wrong! @ Jaime – I’d definitely chalk the early rising up to illness, if it’s not the norm. Illness can make sleep CRAZY. I’d say offer comfort, for sure, but don’t spend a week creating a new sleep habit (i.e. don’t bring her into your bed early and let her sleep with you until her usual wake-up time, unless you want to do that long-term). @Emily, thank you so much for the taking the time out to answer my question. We have been trying to put her down early for bedtime, but about how much earlier should we aim for? Also, We just started her in partime daycare last week (she will go 3 full days a week) and they only offer 1 nap during the day after lunch – should I try and get my daughter on that same schedule so that there’s no confusion for her from switching back and forth? If so, can you please tell me a good approximate schedule for how her day should be? I’ve been through this website and the schedules section quiet a bit, but still not sure how much of a nap I should let her have and still make sure to keep her bedtime and those sleep hours in tact? Thanks in advance! Best of luck to you, Jaime! Hi, it seems like my daughter who is about 12.5 months old is going through the 12 month sleep regression. How do I help her (and myself) get through that? She has been resisting all naps (usually 2 a day) for the past 2 weeks, not just the morning nap. For the first week, we went through our normal nap routine and as soon as I put her in the crib, she would cry. Before this, she would just roll over and fall asleep or take a few minutes and then eventually drift off. The only way that I’ve been able to get her to nap is either in the carseat or the stroller. I don’t want to cultivate this habit after trying so hard to make her an independent sleeper, but I’m not sure howelse to get her to nap. She used to have about 3.5 hours worth of naps and these days, sometimes we’re lucky to get 30 min in the day! Needless to say, I feel like we no longer have a solid routine due to this “disturbance”. Please HELP!! @ Jamie – Oh, this is tough! So sorry you’re dealing with this, Jamie. I think in this case, you might be better off using an earlier bedtime, but still putting your daughter down for her usual naps, as you always do. She may fuss, and it’s fine to offer comfort, but doing this will help to preserve her naptimes, and the early bedtime will ensure that she’s not getting too overly tired. You could try this for a week-10 days and then reevaluate. @ Julia – ah, I see. In this case, you could, for now, simply check in on her every time she wakes and offer reassurance. If she fusses often, I’d suggest simply doing whatever you need to do to make thing work. Given how stressful the medical problems sound, it might be best just to do what you need to do to survive for now. If things begin to improve with treatment, or if your daughter seems to show signs of being ready for sleep coaching, then you can move towards using the strategies in that free toddler guide. @Emily, thanks – we have a team of professionals we’re working with, it’s just a long, slow road. Until we can formally sleep train, do you have any recommendations on how to handle her non-pain related wakings? Just keep attending to her? How do you help baby through these sleep regressions? In short, my little girl is turning 1 next week. She has always had sleep issues, however, what we thought were simply sleep issues/needed to be sleep trained in the early months we now know are reactions to multiple food allergies and intolerances. Her biggest reaction is acid reflux and night wakings. We held off sleep training until we had “cry confidence” – and we’re still waiting! We actually have pretty good confidence now, but if she reacts to a new food all bets are off. Her allergies have become our biggest issue, so sleep has been on survival mode until we make progress there. The problem is that she’s such a bad sleeper that anything can disrupt sleep – like the mental leaps. I think she’s going through the 12 month leap now; waking constantly not in pain, and/or simply staring at me for 1-2 hours as she can’t sleep. How do I get through this? This Will Help Me Alot,I Am A New MoM And I Really Appreciate What This Site Has To Offer. Looking Forward To Read This Info. Rachel, from the Amazon reviews of wonder weeks your timing may vary. Your little guys could be hitting the steps early. I’m a big fan of the site and had just been thinking about the ‘wonder weeks’ when I saw a link to this article. Our ten month old son has been a pretty terrible little sleeper since 4 months. Then just about the ten month mark he started doing 6.30-7 at night and we really thought that we’d cracked it. Now a week later we are back to being up every hour or two and I am having to wrestle him into naps and back feeling so frustrated. He has been able to stand and cruise since 6 months and can walk now, so this is not really a case of him being excited by new found mobility. Indeed, in the past health visitors have commented bout what an early developer he is (and an incredibly active boy). Although just over 10 months old, the 52-55 week description seems to fit him better- is this possible? @ Rachel- certainly possible! Some babies focus on certain developmental skills sooner than others – that means that some babies will appear to hit milestones earlier, while others will show off those particular skills later.